FIU has been selected to serve as an early voting site. The site will be the Multipurpose Room of the Student Academic Success Center (SASC) at MMC. 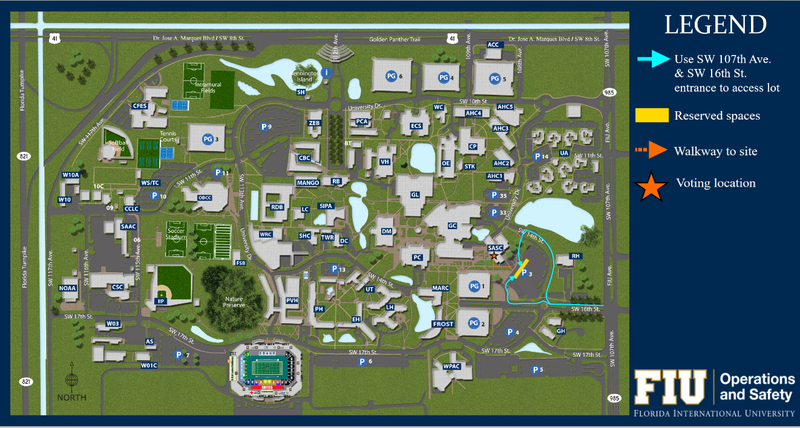 Anyone registered to vote in Miami-Dade County – including FIU students, faculty and staff and community – can vote at this location from 7 a.m. to 7 p.m., October 22 through November 4, 2018. There will be reserved parking in Lot 3. We recommend accessing the lot using SW 107th Avenue and SW 16th Street. Please refer to the map below for further details. For more information, please visit the Miami-Dade County Elections early voting page.